Who is there with a love of true life and a longing for days of real fulfillment? If you should hear that call and answer ‘I,’ this is the answer that you will receive from God. . . . So begins the ancient Rule of St. Benedict, written fifteen hundred years ago as a simple manual for monks living in community together. Because of its gentle wisdom, realism, and depth, the Rule has always stretched beyond the walls of monasteries. Today, growing numbers of men and women are discovering that it can teach them something invaluable about themselves and how to live meaningful lives. 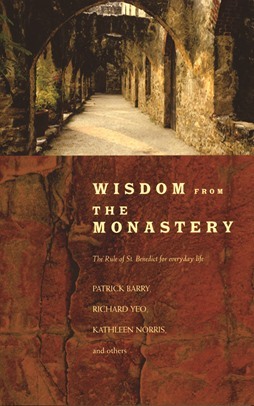 Wisdom from the Monastery contains a contemporary translation of the Rule of St. Benedict and short reflections on the seven basic elements of Benedictine spirituality that are a tried and true recipe for healthy, balanced, and purposeful living. An ideal place to begin a lifetime of exploration and discovery, Wisdom from the Monastery is an excerpt from The Benedictine Handbook, also available from Liturgical Press. Patrick Barry was formerly Abbot of Ampleforth and now resides in the United States. Richard Yeo is Abbot of Downside and Abbot President of the English Benedictine Congregation, England. Kathleen Norris wrote the bestselling Dakota and A Cloister Walk. She is a Benedictine oblate. This is a great little handbook for oblates and others `taken' with the Rule of Benedict, not living in monasteries but those who belong to the wider family of the Benedictine order: oblates, friends, pilgrims or visitors. This little handbook will be a joy for oblates and/or monks in the world. The book is highly recommended for all Benedictine collections and also as a tool for personal spirituality offering words of advice and wisdom across the centuries to those who read it.